I'm writing this aboard Royal Nepal Airlines Flight 410, somewhere above China. I'll post it later but wanted to take advantage of the time on the flight. We left the Philippines this morning headed for Kathmandu and stopped over in Hong Kong. What an incredible city! But I'm getting ahead of myself. There's a detail I had left out of my previous postings because it seemed insignificant, but in hindsight was more providential than we realized. There had been a mix up in the reservations for our hotel and they only had rooms for 2 nights. We had to move to another hotel for the 3rd night. 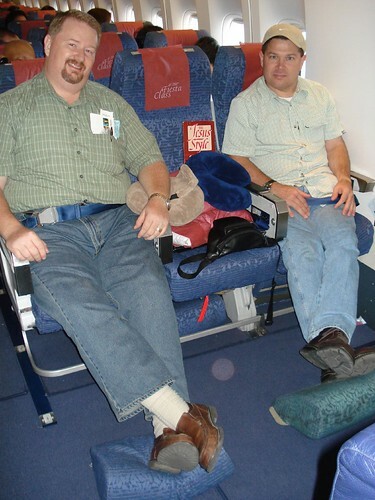 It was only a minor inconvenience that we accepted as part of international travel. However, it proved to be a fulfillment of Romans 8:28, that God causes all things to work together for good for His children. 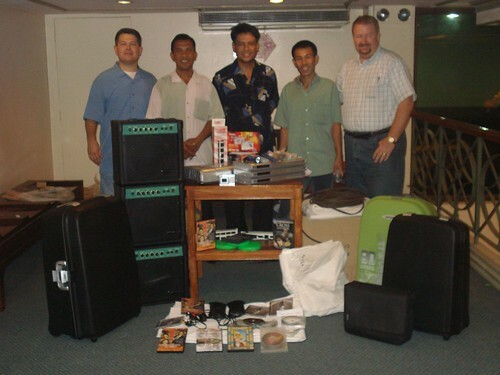 While the brothers were testing the equipment a pastor from Manila who works for the Filipino version of Lifeway saw them and introduced himself. 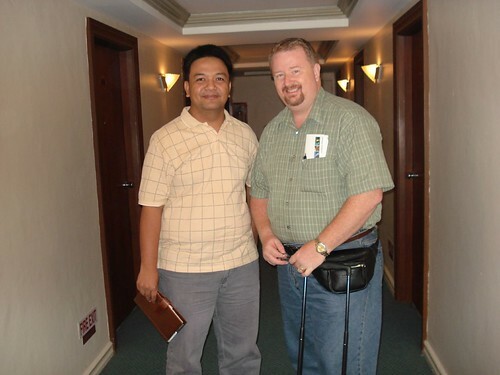 He is bi-vocational, working with local churches around the Philippines to set up mini-bookstores in their churches. He saw that we were playing Gospel films and introduced himself. We had breakfast with him the following morning and joined us in praying for and commissioning the brothers to the work of CSC. He will be a tremendous resource for the brothers as well as a great contact with other churches to let them know about CSC. We were very pleased to meet him and felt like it was part of God's plan for the trip. His name is Reuel and I won't tell you his last name, for reasons that will be clear in a minute. I asked Bro. Reuel to share about something I had been reading regarding the Filipino church's take on world missions. Thousands upon thousands of Filipinos work in other countries in service areas and caring for children, especially in areas like Saudi Arabia. The Filipino church is training their members in evangelism before sending them out to work in foreign countries. They are exporting tent-making missionaries. Reuel confirmed that not only is this true, but his father is the leader of an underground church in Saudi Arabia, serving in a trade by day, evangelizing by night! 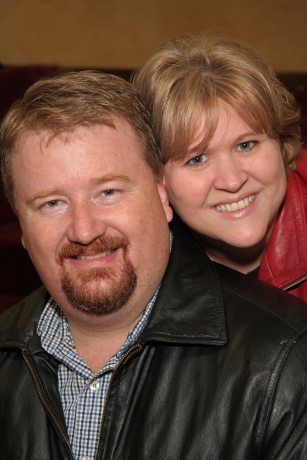 There have been security problems at times, including many Christian workers being exported for sharing their faith. Reuel's father was almost nabbed in one raid on a secret meeting, but he left just before the religious police arrived. Others have not been so fortunate, some being arrested and deported for their role. However, there is one bright spot ... the world's attention has been diverted to fighting terrorism and that is allowing the believers a little more freedom in these closed countries. So God uses even terrorism to cause His Good News to reach the world! I'm purposefully not including the Reuel's last name to avoid any problems for his father. But we are grateful that the Lord brought him across our path. We had held off on selecting a country director until the last minute. Yesterday morning Patrick and I both felt a confirmation that Brother Elmerson (Elmer) was the one but we wanted to have some sort of confirmation from the brothers. Last night we gathered in our room and asked them if the Lord had directed them in this matter. Brothers Jessie and Benie told us that they had discussed privately that they felt Bro. Elmer should be the director. They had not told Elmer this so it was a surprise to him. It was a great confirmation to us and we rejoiced in the Lord's direction. We laid hands on Bro. Elmer to commission him as director and then on Benie and Jessie. After sharing some scriptures and final prayer, we departed the hotel for the airport. In some ways we felt like Paul on his missionary travels who would go to a city, establish a work and then move on, not sure if he would ever see those new believers again. We shared with them that we may not ever see them in person again. It is our desire to do so and we will be in contact via the Internet, but it's possible we'll not see each other until the Lord returns. But we're part of the family of God and part of the CSC family and that connection is strong ... it is a great encouragement to them to know they are not alone. One funny thing on that flight was they told us the meal offerings would be a choice of roasted chicken or pork belly. I've never been offered pork belly on a flight before and we joked that even if we asked for chicken they would be out by the time they got to us ... and sure enough they were. Then one of the stewardesses “found” two chicken dinners on another tray, but by then we had worked ourselves up to eating the pork belly lunch ... and it was delicious! I'm going to end today's update here. We've just been served a delicious supper by our courteous Nepalese flight attendants followed by tea. Patrick tells me to get used to drinking lots of tea and that I'm about to be in for a culture shock in Nepal and India. He and I have traveled all over Latin America together but he's already been to India and Nepal and knows what to expect. I'm looking forward to experiencing it and sharing it with you. If you survived this far, thanks for reading! P.S. I've uploaded a few more of my pictures to my Flickr account. You can view them normally at here or as a slideshow. I hope you enjoy! And the mango, wow, I learned to love mangoes while stationed in the Philippines. Did you come across some baloots? When I was there the young girls could be seen everywhere with baskets of flowers and baskets of baloots for sale. We had a good service this morning. Prayers were offered for you and Patrick. (I ministered on the Ascension and Coronation of Jesus.) This evening I'll be talking with folks about the 'truth'expressions of the new covenant. As for your trip, I'm very excited to see how the next two legs of your mission journey unfold. Everything so far shows the hallmarks of God's providence on you and Patrick. Thanks again for sharing with all of us. Donna has a board set up front of Christian Challenge with your reports and pictures. Mom sends her love. Give Patrick a special hug for us. The Lord is surely smiling on both you warriors of the cross. Im glad so enjoyed your stay in the Philippines... hope to see you back in the islands! Good to hear from you. I really was about to buy you that guitar until I saw the "Made in China" sticker inside! I didn't come across any baloots. I asked the brothers and they were not familiar with them. Of course, I may not have been pronouncing the word right. Or maybe that's more of a Luzon island thing. Glad to hear about the service. I had sent a video greeting but I don't know if they were able to play it or not. Sounds like it was a good ministry. I hope ministering in the morning and then doing the evening Bible study isn't too taxing on you. Thanks for the prayers. Things are going well in Nepal. But the Internet connection is about to kill me!!!! I didn't know how good I had it in the Philippines with relatively high speed connection. This is slower than dialup!!! Give mom my love! Thanks for the note.